Jason points out the new offerings coming soon. 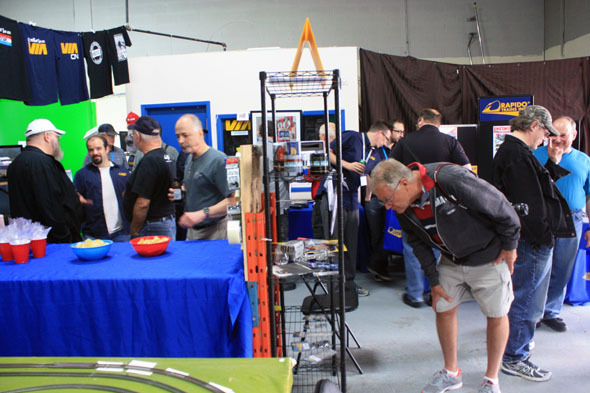 The Second Annual Dealer Open House at Rapido Trains. The original weather forecast for Monday June 26 was for a mix of sun and cloud with a possibility of late afternoon rain, especially in the Toronto area. By the time the actual day dawned, the prognostication had been upgraded to a probability of heavy rain in the afternoon. Skies were still bright when we departed London at 08:30, but clouds were obviously building to the east. Our original plan had been to make several railfan stops en route, but we decided to alter our plans to take advantage of the sunny conditions close to home. As such, we ended up spending a couple of hours in the Ingersoll/Woodstock area. We watched a pair of Ontario Southland SW1200RS units switching at the Cami plant, and chatted with the crew of the OSR Woodstock turn. Shortly afterward we followed the turn (OSR FP9 1400/GP9 1620) to Woodstock, with photo stops at Ingersoll, Beachville, and Carew. From there, it was a straight run to our lunch stop in the Campbellville/Guelph Junction area. I think I got the whole scene covered at Ingersoll. Following a quick stop to check out the old Milton station, we were off to make a hobby shop detour to Credit Valley. Last year we had found some really good deals there, but this year we left without too much wear and tear on the credit cards. 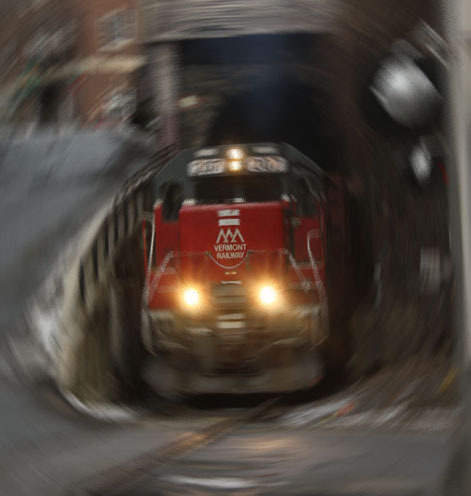 It seems that the hobby has become the exclusive domain of the $50 freight car and the $350 locomotive. Shortly after we got on to the 407, the deluge started, slowing traffic to a crawl. We were glad to finally leave the highway at our exit, and pulled into the parking lot at George's Trains. Disappointment number one - as it turned out, the store is closed on Mondays. Oh well, by then it was 4:00, and we could head across the street towards the Rapido parking lot and look for the Rapido bus. This was the ex-TTC GMC Fishbowl bus that became the prototype for the soon-to-be released HO scale model. Disappointment number two - the bus was a no-show, MIA due to a wonky turn signal. Guess we'd have to limit ourselves to the indoor activities. The Rapido staff was out in force for the day's festivities. As usual, they were friendly, helpful, and informative. George cornered Dan Darnell and got a lot of helpful information about using the new Rapido paints. In addition to speaking to the Rapido staff about available and upcoming products and deals, we were able to visit with the local ESU LokSound representative Bob Fallowfield. 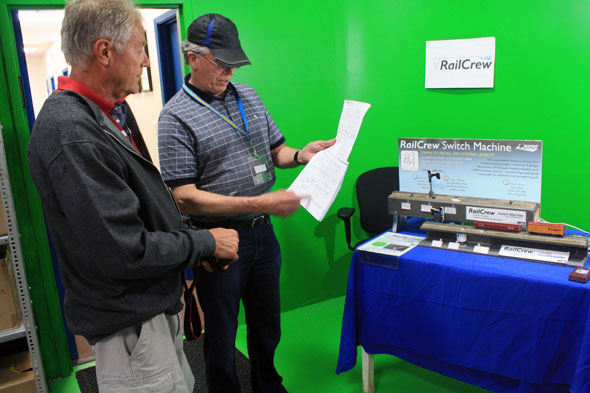 Also present was the designer of the Rapido Rail Crew switch machine. He was telling us about a new layout project being designed for the museum in Southampton. We had a great look at two finished SW1200RS and an undercoated version operating on a loop. On display were pre-production examples of many upcoming models, including the CN Dash 8 and the cylindrical hoppers which hopefully will hit dealer shelves by this fall. 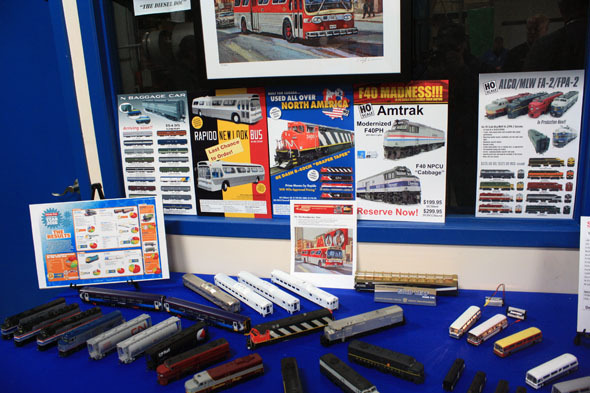 Also nicely displayed were many of Rapido's smaller detail parts, along with their full "swag" line of hats, t-shirts, and mugs. 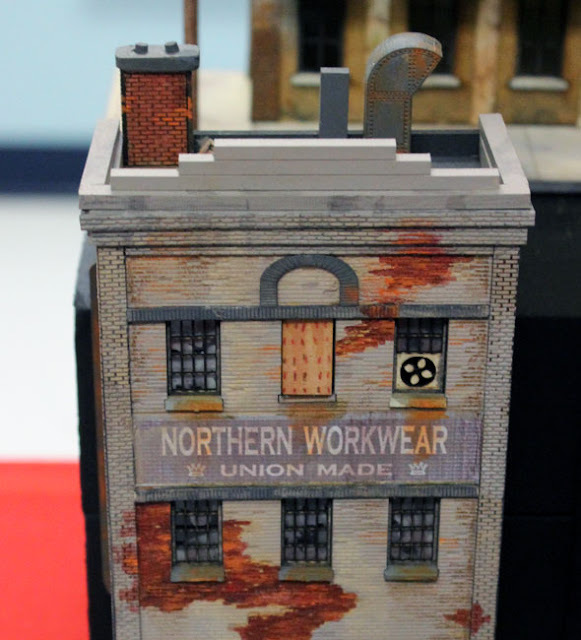 Scheduled for this open house was the Big Announcement of three new upcoming projects, two in N scale, and one in HO. 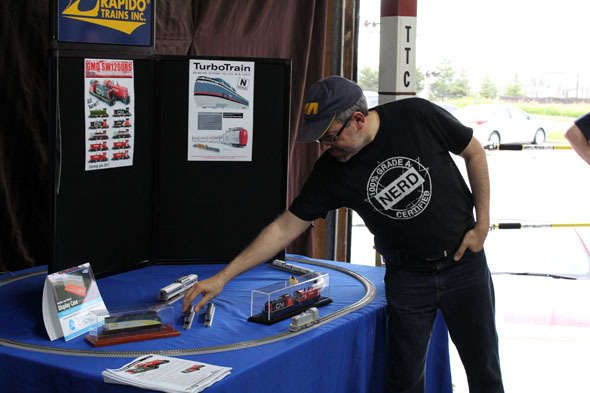 Jason began with with the N scale items, namely a New Haven passenger car and the Turbo Train. 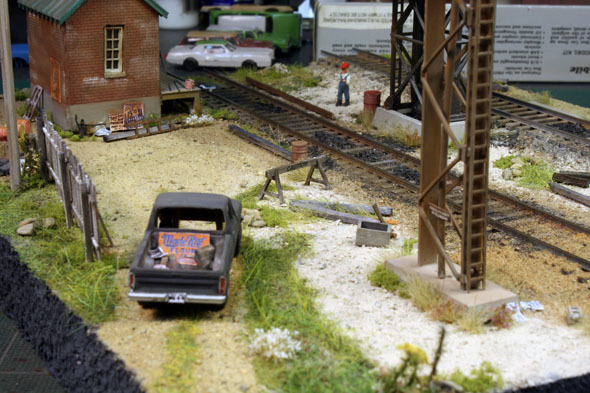 The big surprise for us was the announcement of an HO scale model of the SW1200RS, the iconic Canadian small road switcher of the late 1950s produced by General Motors Diesel. Under development now for almost two years, word is that Rapido may have these available by early 2018. Apparently, Rapido researchers have made numerous visits to the Salford/Ingersoll area, crawling over those very units that we had watched working the Cami yard earlier in the day. At any rate, this was an announcement that will likely be welcomed by many CN and CP modellers. Ironically, production of this same model was announced some time ago by True Line Trains, so it will be interesting to see how this all plays out. As with last year's event, both of us enjoyed both the Rapido experience and the other components of the day. We're already making plans to attend next year's open house - after all, we still want to go for that bus ride! 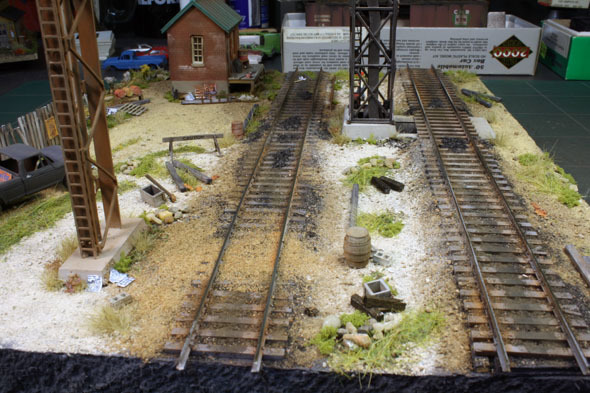 I discussed with Randy of Railcrew the new historical display being built in Southampton of the railway leading into town. This will be on display at the historical museum in his hometown of Southampton, Ont. Randy is showing me the trackplan of the display while Peter snapped a shot. An overall view of products on the way. There was a lot to see this time around. I was checking out the small details that are available if the complete model is not needed. Peter and I had a beer in stubby bottles...something I have not had in a long while. 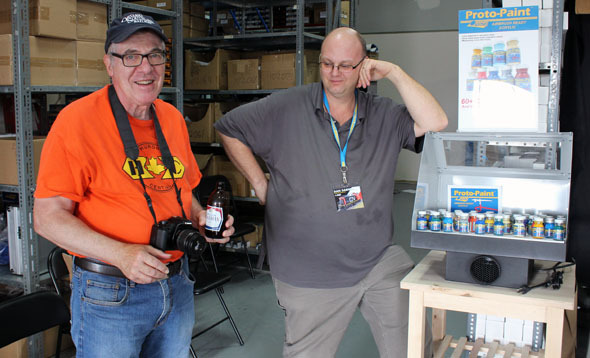 Here Peter is with Dan Darnell after we cornered him to ask about Proto Paints. Dan does a lot of the painting for Rapido. Some of the neat looking mugs offered. 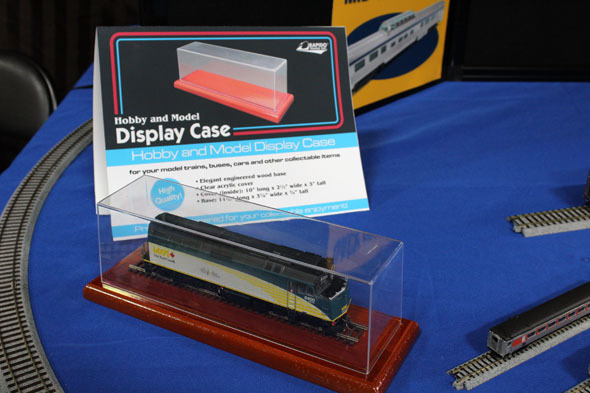 Rapido is now in the display case business. 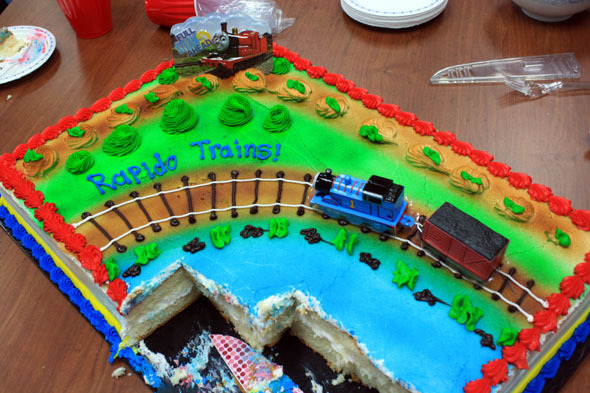 And as last year Rapido finished off the open house with a cake. Not a lot of the guys got into it but Peter and I got our share...we stayed behind for seconds. I am sure the Rapido staff did not design this cake ...or I hope they were not involved. Note the track gauge begins as narrow gauge and by the time the train heads off the cake it is broad gauge...I am thinking the engine is standing on the only piece that is standard gauge. A True Line Trains CNR caboose is bringing up the rear of the through CV freight. Imagine That structure including boarded up windows. I took these photos at this years NFR convention. If one is looking at modeling an abandoned or not in use structures, boarding up the windows is a detail one is looking at replicating. At this years NFR convention I noted a few windows boarded up on a structure displayed by Imagine That. 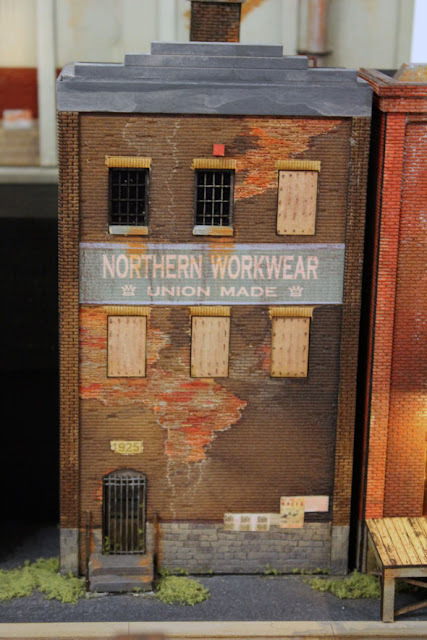 I asked the company's model builder how he did it. The building being laser cut brick into wood he simply turned around the window cutouts and installed. The backside is smooth and actually looks a lot like plywood. He also adds some stained nail markings which really adds to the effects. 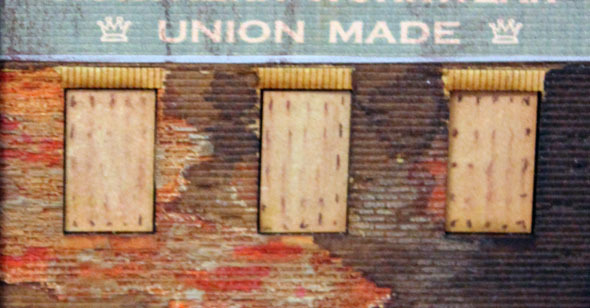 A close up look at the plywood panels. On this model only one window is boarded up. It actually is the opening cutout turned around, another Imagine That structure. Looking down at the sand tower and shop details. I did something different with my trackwork. This area got some heavy weathering following what I have learned from FOS Scale models. 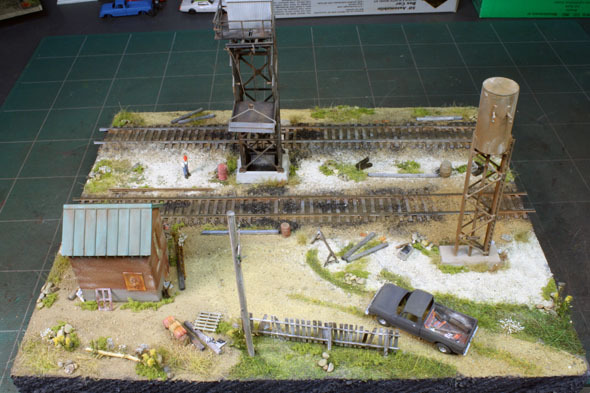 I added a lot of smaller details and static grass along the edges and between the rails near the end of the tracks. 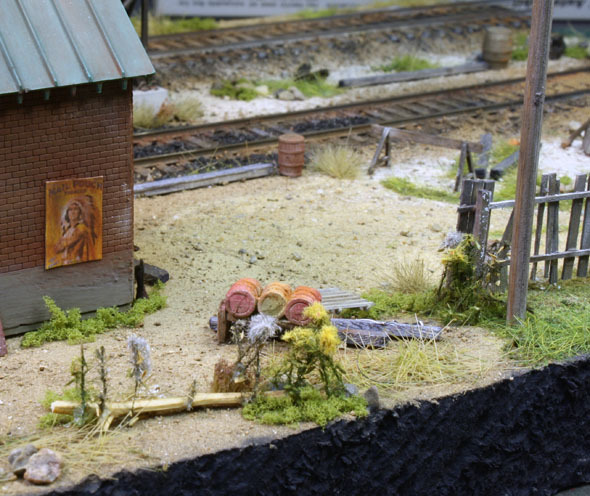 The fence is scratchbuilt. I added some golden rod to the scene. Note I have also used a leftover Osborn Models barricade. 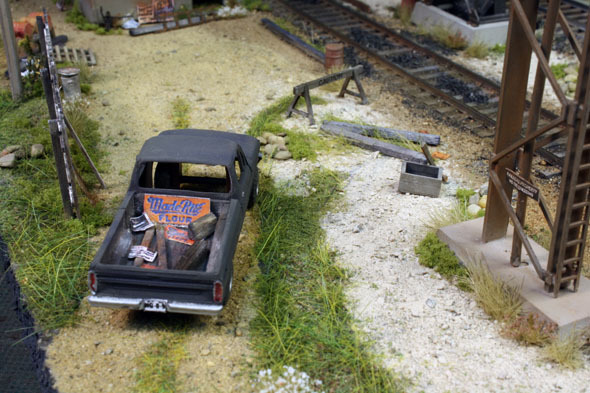 I had a pickup truck that I painted and weathered up. Not a great model but by the time I added plates some painted details and some interesting things in the box it looked pretty good. The roadway had some fine static grass added down the middle. A better look at my pickup truck. 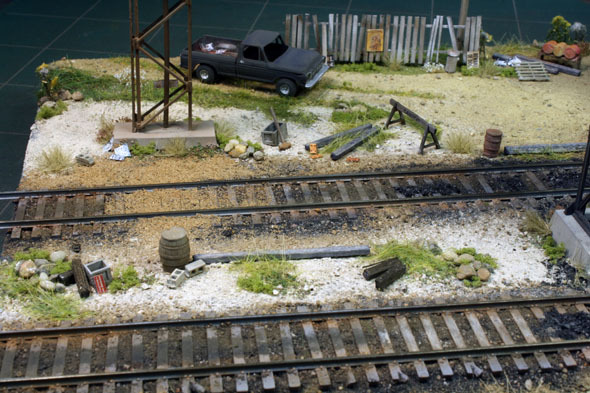 A look down the tracks into the scene. Another overview of my little diorama. After I spent time browsing the indoor exhibits I started strolling around the grounds at Exporail. 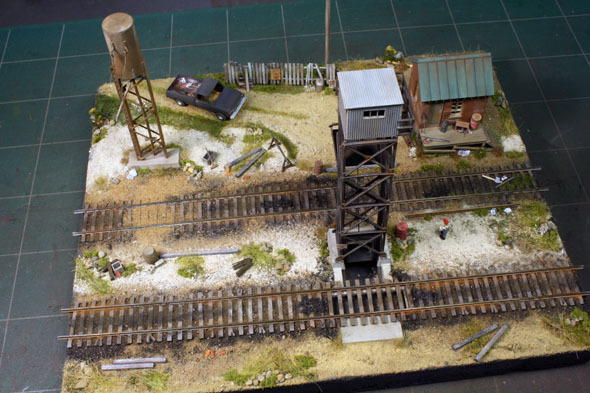 There are a surprisingly large number of track throughout the grounds and a varied collection of equipment. A lot of the pieces were starting show some heavy weathering and rusting. Much of it was more "modern" than what is on display inside. I am assuming this might be more recently acquired equipment or pieces they feel are still in good enough shape to be stored outside until such time they are restored. I also think they are out of any more indoor storage facilities. There is also another large building, the one I remember from my last visit to Exporail, which has a very nice collection of well preserved equipment. It was quite dark and aisles were very narrow so I didn't try to take many photos in there. Some of the more noteable items were a CPR 2-10-4 Selkirk, CNR 4-6-4 #5702, CN 4-8-4 #6153, CNR 4-6-2 #5550 and a very nicely restored CPR MLW switcher #7077 and C424 #4237. Exporail also has a few diesels that have been restored to working condition that they use to pull coaches up and down a short stretch of track. These include a beautifully restored CNR 1200RS #1382 and a rebuilt CPR GP-9 #1608. Hopefully in the future they will be able to raise enough funds to add another exhibit hall and get the remaining rolling stock restored and put inside out of the weather. The folks at Exporail have done a fabulous job on the museum. 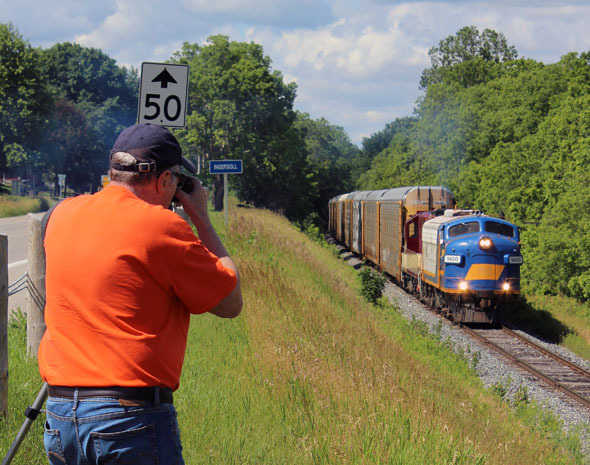 It is a "must see" stop for anyone interested in railway history who is in the Montreal area. I know I am really glad I took the side trip from Ottawa to Montreal to take it in. VIA LRC unit 6921 is still in relatively good shape. Unfortunately the placed a boxcar against the nose so I couldn't really get a good shot of it. I remember working a couple of trips on these and was surprised how spartan the cabs were compared to the streamlined exterior. Another Bombardier locomotive on display was SLQ 3569. This ex CNR M420 likely started life as CNR 2569. I made many trips on these and they were my least favorite units to work on, cramped cab, noisy and rough riding. I was glad when CN got rid of them. One of the units CN ran in Newfoundland was on display. It sat on a piece of narrow gauge rail. Although you might think my photo is crooked, it is actually the track which took quite a dip causing the engine to lean. Notice the olive green paint bleeding through on the cab roof. These two pieces of MOW equipment were quite interesting. The little crane is small by today's standards. This interesting semaphore signal was used to direct traffic at a diamond. CNR 1382 has been beautifully restored to operating condition and is used to pull cars in the museum It is one of the last batch of GR-12's that CN bought. As one continues to stroll through the huge indoor display at Exporail you keep discovering new and unique pieces of equipment. If you were to read evey information plaque and go through every open car you could easily spend several hours just in the "Great Hall". 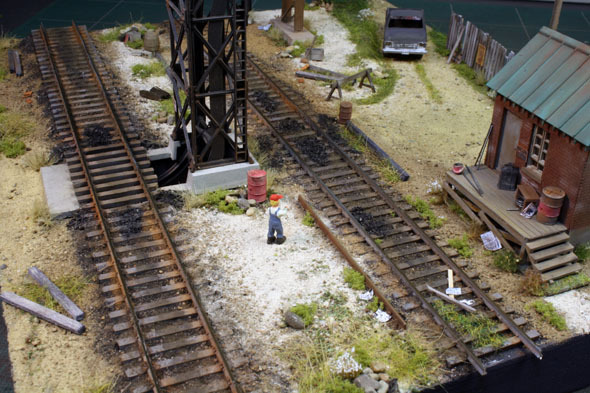 For anyone who has not visited Exporail I highly suggest you add it to your "to do" list. It makes for a great outing. So, lets continue our tour and once we get through the indoor collection we'll head outside to see what they have on display there. This CPR inspection car was in immaculate shape. I looks like CPR officials road in style. The nickname "the Leaky Roof" railroad sure doesn't apply here. CNR 49 was a 4-6-0T which was used on suburban runs in Montreal. Here she is preserved in excellent condition. Compare this photo to one of sister 47 take in Steamtown, PA in Oct.2016. Seems a shame to let her just sit and rot. This CNR Rotary Snowplow has been beautifully restores. Notice from the tender this was an oil burner when retired. The last time I was at Eporail it was sitting outside gathering rust. Indoor storage certainly assures these pieces will be around a long time and good shape. CPR cabooses were represented also as can be seen by this great looking wood sheathed caboose. Many old CPR cabooses had plywood sheeting added to them in later years. This car had quite a different hand brake setup. It looks like it would be pretty awkward to get to and use. 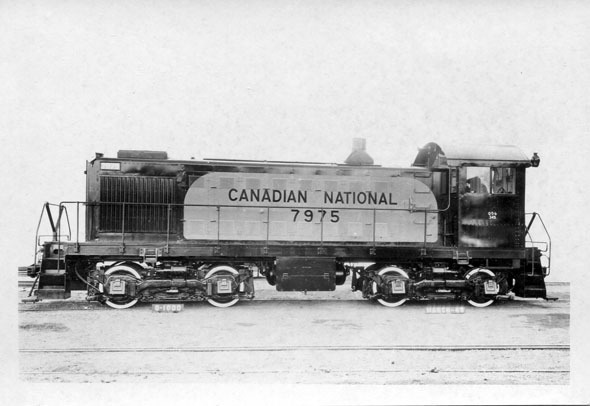 #77 was one of CNR's first diesel switchers and featured an early style of carbody that allowed good visibility. 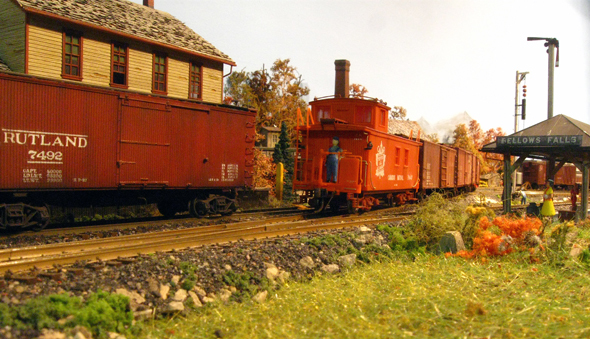 Note that the crew had to enter the locomotive through the red door on the side as these units had no end platforms. CPR 4744 was a one of a kind M640. It had an ALCO 251F, 18 cylinder engine rated at 4000HP. It was retired in 1992 and donated to Exporail in 1998. Layouts - Smaller or Larger?